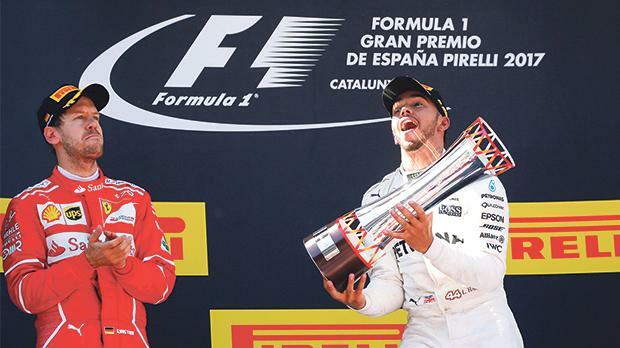 Mercedes driver Lewis Hamilton lifts the Spanish GP trophy in front of Sebastian Vettel, of Ferrari, at the Circuit de Catalunya on Sunday. Lewis Hamilton has hinted for the first time that his friendly relationship with Sebastian Vettel could be under threat after their wheel-to-wheel duel at the Spanish Grand Prix. Hamilton moved to within six points of his title rival after beating the Ferrari driver to victory following a scintillating tussle between the two championship protagonists in Barcelona on Sunday. At one stage of a breathless race, Hamilton and Vettel came within centimetres of crashing as they diced for the lead at turn one, with the former forced off the circuit. Hamilton described Vettel’s tactics as “dangerous”, and the pair, albeit light-heartedly, later disagreed on whether they afforded one another enough room. After his victory at the second round of the season in China, Hamilton said he saw no reason for his amicable rivalry with Vettel to turn sour, but the 32-year-old Briton towed a noticeably different line in Barcelona. “I don’t know,” said Hamilton when asked if he expected his cordial relationship with Vettel to last. It is difficult to say. “It was a very close battle and if it had gone in a different direction, it would have been different between us. “You know how racing goes. If he had hit me in turn one and had won the race, it would not have been ‘great job, Sebastian’. It was aggressive but fortunately I was still able to remain in the fight, and ultimately I avoided the collision. Hamilton will now head to the Monaco Grand Prix a week on Sunday six points behind Vettel with both drivers level on two victories each in a season which is shaping up to be an all-time classic. The Briton’s triumph in Barcelona could not have been more different to his troubles in Spain last year where he crashed out of the race following his opening-lap collision with Nico Rosberg. Hamilton admitted he hit rock-bottom after the incident which left him 43 points adrift of Rosberg in the championship race. And although he managed to reel in his former Mercedes team-mate – indeed he was 19 points clear of Rosberg during the sport’s summer break – he ultimately fell short of stopping his fierce rival from winning the title. “What matters is that I am leading the championship after the last race of the season, and that’s my thought process,” Hamilton added. “Of course I want to win Monaco but the importance is not the points but the actual win. For me it is about consistency and taking that form from this weekend into the 15 races that we have left. “I love tennis, and I love watching Roger Federer and Novak Djokovic in the final, and what I really admire is consistency.